I want to go back and talk a bit about my inspiration for my final paper, my plans for how I hope to see it expand, and the ways in which the readings from the most recent few weeks have influenced my methodology. While originally I planned to write on Shelley Jackson’s Patchwork Girl, I instead chose Christopher Nolan’s Memento, Kenneth E. Foote’s “To Remember and Forget: Archives, Memory, and Culture,” Walker Sampson’s From My Archives: Derrida’s Archive Fever, and Baudrillard’s Simulacra and Simulation. After a bit more reading, I became particularly interested in putting some of my newfound knowledge on archives to work. If anyone has feedback from this post, I would certainly appreciate it. I would also be happy to integrate responses from comments into my paper. So first, I’ve taken to Memento to see it as a representation of an ‘archive gone bad.’ While Leonard Shelby seemingly functions fairly well throughout the course of the film with his “condition,” by the end, it becomes quite clear to the viewer that Shelby’s ‘truth’ is not an objective truth, but a newly constructed one. Baudrillard would call this the hyperreal—where the ‘reality’ that Leonard constructs becomes more ‘real’ than the objective reality surrounding him. Leonard, by re-writing the metadata (the notes on the polaroids) is able to re-write the cultural memory within this archive of his mind. Leonard is able to re-make his archive in order to shape his ‘facts’ to fit the constructed reality—thus his ‘facts’ come to have no real association with any of the objective reality at all in the film. I see Leonard constructing an exemplary model of an archive gone wrong here. Since our readings that related to archives fell at the tail-end of the semester, I’ve been looking for other examples of archives to which I can apply Baudrillard, Foote, Foucault, and Sampson’s review. I recalled that over winter break I was wandering around the city and managed to find myself in the National Archives. I came to realize that one document in this institution provides another excellent model for me to attempt to apply this methodology: The Declaration of Independence. 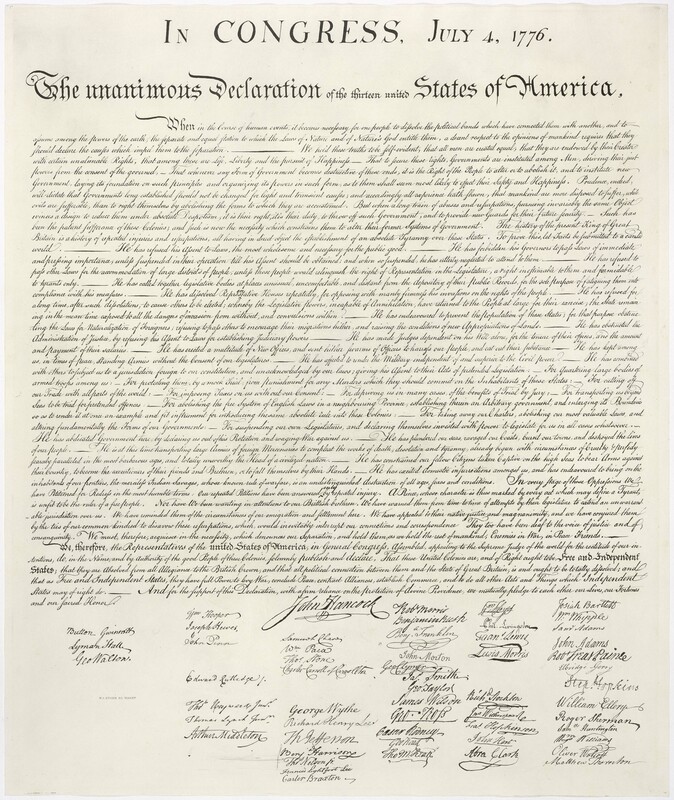 After recalling a bit of reading from when I was there some months back, as well as a bit more research for this post, the original Declaration of Independence (if we can even point to one original) was itself copied in order to create the Dunlap Broadside, which was printed on July 4, 1776 and copies were handed out the next day. If we recall Baudrillard’s notion of the four stages of the sign-order, this seems to fit the bill of the first stage perfectly. Now, although the original that was used to print the Broadsides is lost, the document on display is a copy from the original, but it’s an unfaithful copy and not accurate to the ‘original.’ The unfaithful copy that we see in the Archives (the one with John Hancock’s John Hancock printed so prominently) is at the second stage for Baudrillard. The third stage is where the simulacrum pretends to be a faithful copy, but it is a copy with no original. When we walk into the gift shop and see John Trumbull’s Declaration of Independence (the famed image that you’ve almost certainly seen a picture of, or seen if you’ve looked at the back of a two-dollar bill recently) and we look at the copy, we see a great mass of signatories in the image gathering around in the image, signing a copy of the Declaration of Independence. This is a representation of an event that didn’t happen—this idealized version of the document’s signing never occurred—the document was signed over a period of several weeks, which doesn’t make for a particularly exciting painting. Still, there’s a connection with the ‘true’ signing, though this is the copied representation of an event that never occurred (it has no ‘original.’) And finally, comes the fourth order of the hyperreal—at this stage there is only pure simulation. There is no legitimate connection with any real event, although this form comes to inhabit its own reality, baseless as it may be. Disney (Baudrillard’s favorite theme park and movie production company) made the hardly memorable National Treasure in 2004, starring Nicholas Cage. In the film the Declaration of Independence becomes pure simulation, with no relation whatsoever to any reality. Nicholas Cage plays an American treasure hunter who steals the Declaration of Independence from the National Archives in order to decode the document’s hidden message (a series of clues leading to treasure). The document itself is an encrypted map that leads the hunter to this treasure horde, which is a massive pile of looted treasure acquired over thousands of years of stealing from other cultures (and stealing from their cultural memories). Of course, this treasure is found, and the Declaration of Independence had led them to the greatest desire of any American—outrageous wealth. National Treasure’s narrative is completely baseless, and within its own narrative, makes the Declaration of Independence’s meaning even more real within the context of the story (and complete spectacle at that). This new meaning is completely disconnected from any previous conceptions and firmly stands at the level of the hyperreal. Although these close readings are both planned to be included in my final paper, the process of thinking through this knowledge that I already had with the aid of Nolan, Foote, Baudrillard, Derrida, and Sampson’s writing in mind greatly helped me to grasp the ways I might apply this knowledge. It’s been an excellent semester all, and I’m thankful to have been able to work with all of you! As promised, I’m sending along some information on Twine. Twine is open-source software (so free of cost and freely editable). It also runs inside your web browser, so there’s no need to do any ‘proper’ installs to run the tool (so, it runs in modern browsers including firefox and chrome; also safari and IE—if you call those last two ‘modern’). Are you looking for some samples texts and asking yourself, what can Twine really do?? If so, try this link or this one (They both have very nice interfaces—the former is formatted more like a book, while the latter more like a piece of text-based IF). Last class, Neil asked us to post a bit about what we’d like to see done with PG for the class project. Personally, I think something along the lines of a reimagining of the text, perhaps in the piratical sense of “PG 2.0” is ideal to me. That being said, I understand that there are some logistical difficulties that we might run into. I realize that this post is sounding vague, but that’s intentional–we discussed some of the finer details in class. I think that my ideal project has us creating PG 2.0 on Twine, or a similar platform. Then the final version of what we create would be hosted on the web, possibly on a series of mirrored sites and servers spread across the web by an anonymous party. We wouldn’t need to take credit, and credit wouldn’t be “due” to anyone. The idea of reviving and setting Jackson’s PG free seems desirable to me. As we discussed in class, I see Jackson’s PG as caged in by current copyright law, by the constraints of the media (CD-ROM, USB drive, Floppy disk) and barred away behind these constructs.